The Governments of Canada and Yukon are investing in modern public infrastructure that will help create jobs, while improving Northern Canadians’ quality of life and contributing to stronger northern communities. Member of Parliament Larry Bagnell, on behalf of federal Minister of Infrastructure and Communities Amarjeet Sohi, as well as Minister of Community Services John Streicker and City of Whitehorse Mayor Dan Curtis, today celebrated the completion of seven infrastructure projects in Whitehorse. Among these projects, the City of Whitehorse has converted the Takhini arena and Canada Games Centre to LED lighting to lower energy consumption, as well as improved the storm water system at Burns Road to better protect the property and livelihood of local residents. In addition, the city has recently purchased two new buses to provide riders with additional modern transportation solutions and a better overall riding experience. This transit service improvement falls under the Whitehorse Transit Master Plan, which aims to make it easier for citizens to use the city’s public transit by providing safe, convenient and reliable service for years to come. Working together with our territorial partners, we are committed to making sure northern communities get the support they need to grow the economy and address local infrastructure priorities. These completed projects will make Whitehorse a stronger, more inclusive and sustainable city, and provide greater opportunities for those living and working in the North. Yukoners can ride a new bus up to the Canada Games Centre, and get active under new energy efficient lighting. These projects help to make Whitehorse sustainable and vibrant while supporting the local economy and reducing greenhouse gas emissions. We are proud to work together with other levels of government to build strong, healthy communities in the Yukon. The City of Whitehorse is very appreciative of the funding it receives via the Public Transit Infrastructure Fund, as well as the Gas Tax Fund, which goes towards improving our ageing infrastructure. I am humbled by the time and energy that was spent making this funding possible for the City of Whitehorse, for facilities and infrastructure that will be used by residents and visitors alike. I am truly honored to have such a strong working relationship with our local First Nations, the territorial and federal governments. 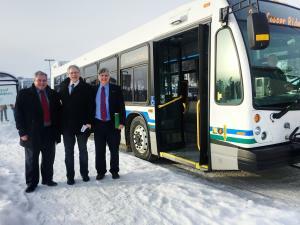 The Government of Canada provided $890,000 through the Public Transit Infrastructure Fund (PTIF) for the purchase of two new transit buses and the Government of Yukon contributed $296,667. In addition, the Government of Canada provided $1,071,149 through the federal Gas Tax Fund (GTF) for the remaining six local infrastructure projects.